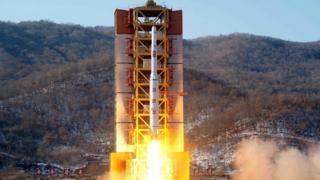 North Korea said the rocket it launched on the morning of 7 February was to put a satellite into orbit around the earth. Some reports said the payload of the missile fired could be as large as 500kg (1,100lbs), many times the size of the Unha 3 missile payload put into space in December 2012. These sources also suggest that the range of this new missile may be as much as 13,000km (8,000 miles) compared with the roughly 10,000 km range of the Unha 3. Further analysis is required to confirm these estimates. But if these numbers are true, this new missile is a major advance for North Korea. A missile fired from North Korea with a 13,000km range can reach any location in the continental United States. And a 500kg payload is apparently closer to what might be required for a nuclear weapon. On the other hand, this missile is not yet a true intercontinental ballistic missile (ICBM). It is a very large missile that must still be put together on a very large, fixed launch pad. It apparently takes days to prepare such a missile, time during which it could be destroyed if North Korea threatened hostile use. Destroying such a missile on a large launch pad should be relatively easy once conflict begins. North Korea has been working on a true ICBM, the KN08. It is a missile carried on a mobile launcher, which would make destroying it much more difficult. But the KN08 has not yet been tested. Moreover, while North Korea has tested re-entry vehicles (to protect the warhead) for shorter-range missiles, it has not tested re-entry vehicles for long-range missiles. Even if North Korea is able to miniaturise a nuclear weapon (which is still uncertain), that weapon and the re-entry vehicle must be able to withstand the extreme temperatures and other challenges associated with re-entering the atmosphere to place locations on Earth at risk to most nuclear weapon effects. While this launch will assist North Korea in mastering several characteristics of long-range missiles, North Korea does not yet appear to have a viable ICBM with a nuclear warhead that could reach the US. If this test does not give North Korea a nuclear ICBM, why is the North doing it? UN sanctions have been designed to stop North Korea from carrying out ballistic missile tests. Since the missile used in a space launch and in an ICBM may be similar, North Korea has claimed that its missile tests are really space launches of satellites. The UN Security Council resolutions also prohibit North Korean space launches, but the North claims it has the right to do them, and the UN has failed to convince North Korea otherwise. Until now, there has been little question, as North Korea has not previously put a functioning satellite into orbit. We have yet to hear whether the payload of this rocket/missile has proven to be a functional satellite. But the bigger question is why now? Because of North Korean secrecy, we do not know for sure. But it seems likely that Kim Jong-un is seeking clear successes before his important Seventh Party Congress in May when he wants to appear to be the all-powerful leader of North Korea. But he has been experiencing major appearances of weakness. For example, in the last three years China has had six summit meetings with South Korea, suggesting that South Korea is an important country and its president, Park Geun-hye, is a great leader. But China has had no summit meetings with North Korea, suggesting that, for Beijing, North Korea is not a significant country and that Kim Jong-un is a weak leader. North Korea may also be experiencing political instability resulting from the many purges of Kim Jong-un and various regime failures. In November, there were reports that North Korea was seeking a summit meeting with China, in an effort to demonstrate Kim Jong-un's strength. On 10 December, Kim announced that North Korea possessed an H-bomb, possibly Mr Kim's way of pressuring a reluctant China into a summit. The apparent failure of that pressure is likely to have angered Mr Kim, and led to a fourth nuclear test on 6 January. That test had a weapon yield of about 10 kilotons, less than 1% of a traditional H-bomb. It was also smaller than a typical boosted weapon yield, which even North Korea apparently expected would be around 50 kilotons because the North buried the weapon more than twice as deep as its third nuclear test. Observers have generally said that the fourth test was not an H-bomb, and thus a failure for the North Korean regime despite the euphoric public response the regime tried to incite in the aftermath of the test. While China was seriously upset by the fourth nuclear test, its refusal to support further sanctions against North Korea suggests that China is concerned about worsening the instability in North Korea. So the regime needs a success. This space launch may be enough to achieve that political objective. But if it is not, Kim Jong-un may conclude that he needs a more successful nuclear test before the Seventh Party Congress. Hopefully, the US and South Korea will take more effective actions to deter North Korea from such a defiant action. That might include coming up with a package of threats, including stating that more concrete preparations need to begin for a Korean unification that would result from North Korean collapse. Bruce Bennett is a senior defence analyst at the Rand Corporation and a professor at the Pardee Rand Graduate School.